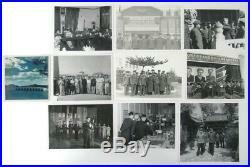 RARE LOT 10 REAL PHOTOS BULGARIAN COMMUNIST MILITARY ARMY DELEGATION CHINA #7>>. DEAR BUYERS, WE ARE PLEASED TO OFFER YOU A RARE LOT OF 10 REAL PHOTOS FROM OFFICIAL VISITATION OF BULGARIAN MILITARY COMMUNIST DELEGATION IN CHINA. THE DELEGATION WAS HELD IN 1950'S WHEN THE PHOTOS WERE MADE. ON THE PHOTOS YOU CAN SEE DIFFERENT MOMENTS AND MEETINGS IN CHINA, DIFFERENT CHINA MONUMENTS, CONCERT OF BULGARIAN MILITARY ORCHESTRA... SOME PHOTOS ARE LIGHT YELLOWED BECAUSE OF THE YEARS. THERE ARE SEVERAL DIRTY SPOTS ON SIDES. THE EDGES ARE LITTLE DIRTIER. THE FRONT GLOSSY SIDES ARE SLIGHTLY SCRATCHED. THE ONE PHOTO IS FADED. AS A WHOLE THE CONDITION IS VINTAGE GOOD. THE BIGGEST SIZE IS ABOUT: 14.7CM X 14.8CM. FOR MORE DETAILS, PLEASE LOOK AT THE PICTURES. Add a map to your own listings. The item "RARE LOT 10 REAL PHOTOS BULGARIAN COMMUNIST MILITARY ARMY DELEGATION CHINA #7" is in sale since Monday, June 11, 2012. This item is in the category "Collectibles\Photographic Images\Contemporary (1940-Now)\Other Contemporary Photographs".